This is the second post from the ‘Hunting the Culprit’ Series. An appreciation that each of the 12 ECG leads is a ‘snapshot’ of the heart from a specific position is crucial for hunting the culprit vessel in STEMI patients. For a detailed explanation of ECG leads, here is the first post from this series – ‘(Properly) Understanding ECG Leads’. 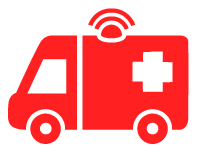 With sound ECG lead knowledge, we know where the ‘cameras’ are positioned (so to speak). But what are we looking at? The heart is an irregularly conical shape, and it is positioned obliquely in the mediastinum. In the anterior view of the heart, all four chambers can be seen. Right border – formed entirely by the RA. Left border – formed partially by auricle of the LA, but mainly the LV. NB: The ‘auricles’ are ear-like muscular pouches that arise from the anterior aspect of each atrium, and serve to increase their blood-carrying capacity. Inferior border – formed mainly by the RV, but partially by the lower part of the RA and the apex of the LV. Anterior surface – mostly RV (remember it is usually an RV injury with precordial stab wounds). 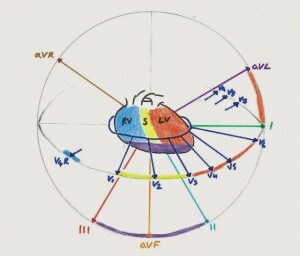 The RV is separated from the RA by the right atrioventricular groove (also known as the right coronary sulcus), and from the LV by the anterior interventricular groove (also known as the interventricular sulcus). Inferior (diaphragmatic) surface – formed mainly by RV and LV separated by posterior interventricular groove. Also formed by the part of the RA that receives the inferior vena cava. Posterior surface – formed mainly by LA with the openings of the pulmonary veins. The heart’s blood supply is derived from the right and left main coronary arteries. The main branches of these arteries lie in the atrioventricular and interventricular grooves that separate the chambers of the heart. The coronary arteries lie on the epicardial surface of the heart, and supply smaller branches to the inner myocardium. When not diseased, the coronary arteries have low vascular resistance compared to their distal branches which penetrate the myocardium. They are considered ‘end arteries’. This means that the region of the heart that each coronary artery supplies has inefficient anastomoses with other arteries. 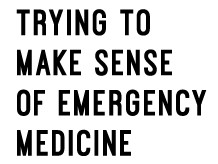 Therefore, blockage of a given coronary artery always results in downstream ischaemic damage. The word ‘coronary’ means crown ‘like a crown’. It describes the encircling arrangement of the arteries that form a crown-like pattern around the heart. Both main arteries – the right coronary artery (green in above diagram) and left main coronary artery (red in above diagram) – arise from sinuses that lie behind the cusps of the aortic valve at the root of the aorta. The RCA arises from the anterior aortic sinus and runs its course in the right atrioventricular groove. It winds around the right side of heart at the inferior border and passes posteriorly. It anastomoses with the termination of the left circumflex artery at the point where the atrioventricular groove meets the posterior interventricular groove – the crux of the heart. 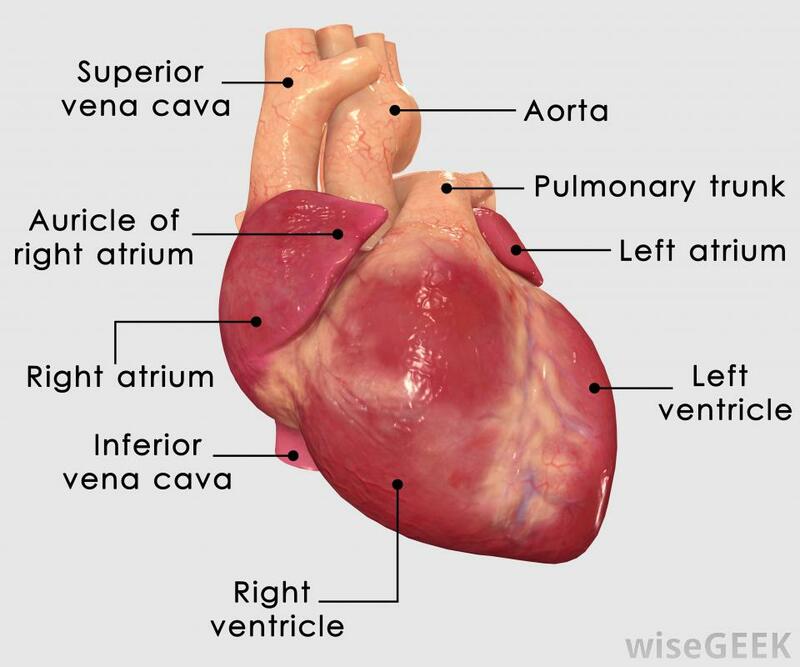 The RCA supplies the RV and the RA – remember these structures form much of the inferior border of the heart. 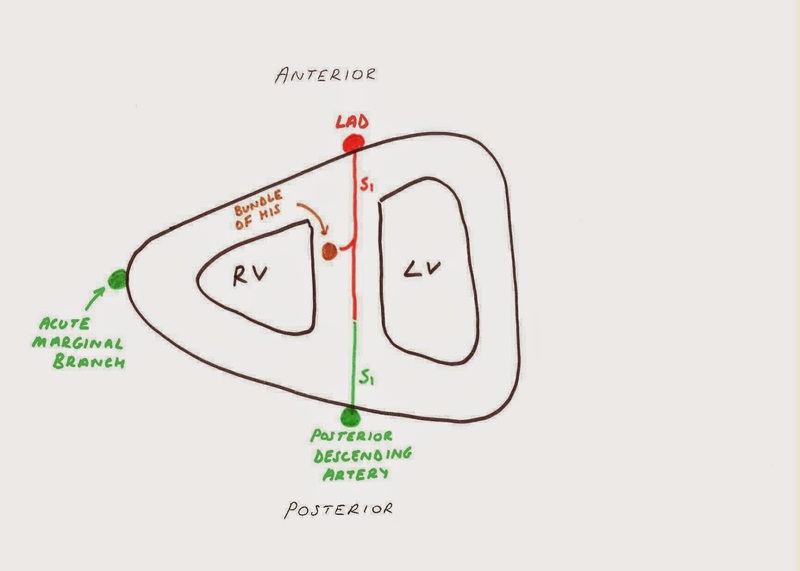 The RCA gives off the acute marginal branch (or right marginal branch) which passes along the inferior border of the heart and supplies the anterior wall of the RV. The RCA (usually) gives off the posterior descending artery (PDA) at the crux of the heart. The PDA runs it’s course towards the apex of the heart in the posterior interventricular groove. The PDA supplies the posterior wall of the RV, a small amount of the posterior wall of the LV just adjacent to the posterior interventricular groove, and the posterior 1/3 of the septum via it’s septal branches. This is larger than the RCA and arises from the left posterior aortic sinus. It first passes behind and then to the left of the pulmonary trunk. It emerges between the pulmonary trunk and the left auricle. The LMCA only runs a short course (10-15mm) before bifurcating into the left anterior descending artery (LAD) and left circumflex artery (LCx). The LAD courses down the anterior interventricular groove. The LAD supplies the anterior wall of the LV, as well as a small amount of the RV just adjacent to the anterior interventricular groove. It also supplies the anterior 2/3 of the septum via septal branches (posterior 1/3 supplied by the PDA). The LAD runs all the way to the apex of the heart where is anastomoses with the PDA. 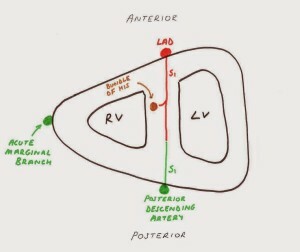 The diagonal branches of the LAD supply the anterolateral wall of the LV. The LCx passes along the left atrioventricular groove. This winds around the left border of the heart and passes posteriorly and terminates at the crux of the heart where it anastomoses with the RCA. The LCx supplies the LA, along with the lateral and posterior aspects of the LV. The obtuse marginal branch (or left marginal) of the LCx courses down the lateral margin of the heart towards the apex. It supplies the lateral wall of the LV, along with the diagonals (branches of the LAD). Coronary artery ‘dominance’ refers to which coronary artery the PDA comes off – as this varies between individuals. Approximately 80% of individuals have a right dominant circulation – the PDA comes off the RCA. Approximately 20% have a left dominant circulation – the PDA comes off the LCx. A small percentage have co-dominance – the PDA comes off both the RCA and the LCx. 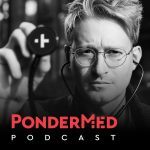 If a wraparound LAD gets occluded, there can be ECG changes in the inferior leads as well as the anterolateral leads (more on that later in this series of posts). The sinoatrial node, which sits in the right atrium, is supplied by the SA nodal branch. This comes off the RCA in 60% of people. In the remaining 40%, the SA nodal branch comes off the LCx. The atrioventricular node, which sits at the crux of the heart, is supplied by the AV nodal branch. The origin of the AV nodal branch is dependent on the ‘dominance’ of the circulation. In a right dominant circulation (80%), the AV nodal branch comes off the RCA. 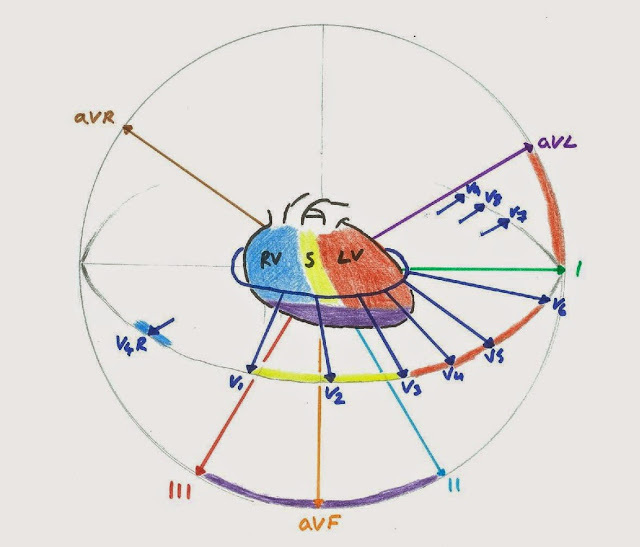 In a left dominant circulation (20%), the AV nodal branch comes off the LCx. In a co-dominant circulation it comes off both. The anterior 2/3 of the septum is supplied by the the LAD, and the posterior 1/3 by the PDA (as illustrated in the diagram above). The blood supply for the Bundle of His is from the septal branches of the LAD. 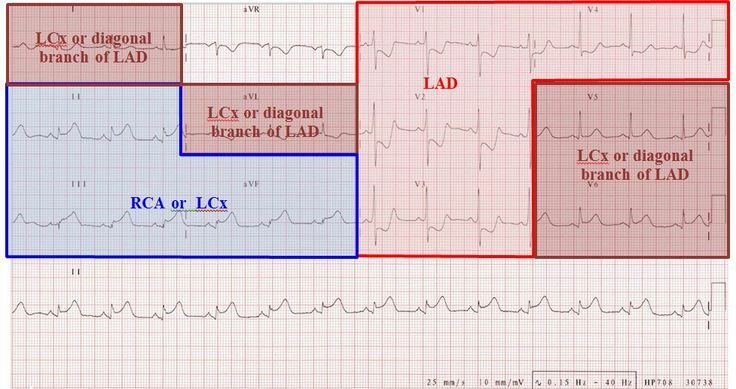 This will be important to remember when considering the various different ECG appearances of proximal LAD occlusion. An appreciation for coronary artery anatomy and what the regions that major coronary arteries supply, allows us to map the injury pattern on an ECG. We can map the injury because we know what region of the heart each ECG lead looks at. For example, we know that leads II, III and aVF are snapshots of the inferior border of the heart. Therefore, it is in these leads that we look for an inferior MI injury pattern. 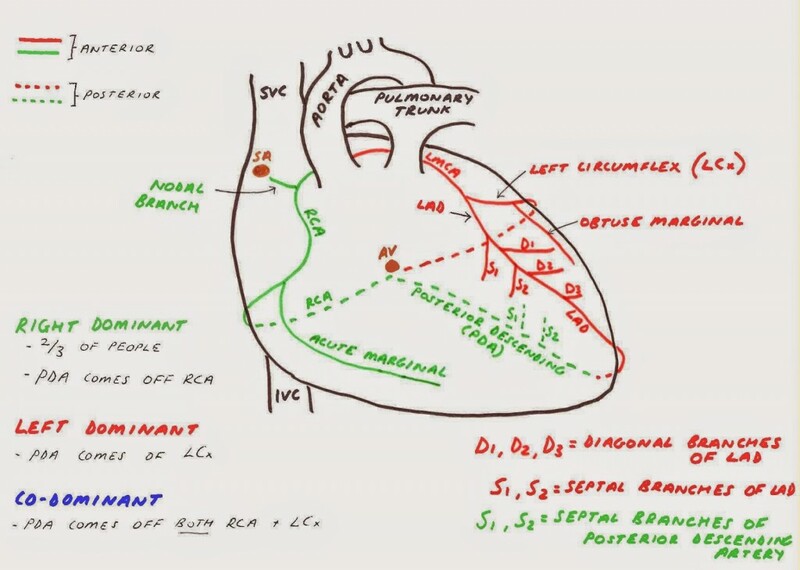 We now know that the RCA (in a right dominant circulation) supplies the structures which form most of the inferior border of the heart – the RV, the lower part of the RA, and the apex (supplied partly by the PDA, a branch of the RCA). ST elevation in leads II, III and aVF with reciprocal ST depression in V1-V4? Likely RCA occlusion. More on this, and ECG patterns for other culprit vessels later on. Right, so the ECG leads and coronary artery anatomy are covered. In the next post in this series, I’ll take a dive into ECG morphology basics, and the classic ECG changes in ischaemia. This series is great. I dont see the rest. Are you planning on finishing it? thanks! Does this series continue? Thanks!